In the early morning hours of July 6, 72 runaway oil tankers slammed into the town center of Lac Mégantic, Quebec, exploding into a ball of flame that killed at least five people. The tankers had been part of freight train parked at the nearby town of Nantes. How the tankers jumped the tracks, and then became unhitched from the train's engine car, remains something of a mystery. 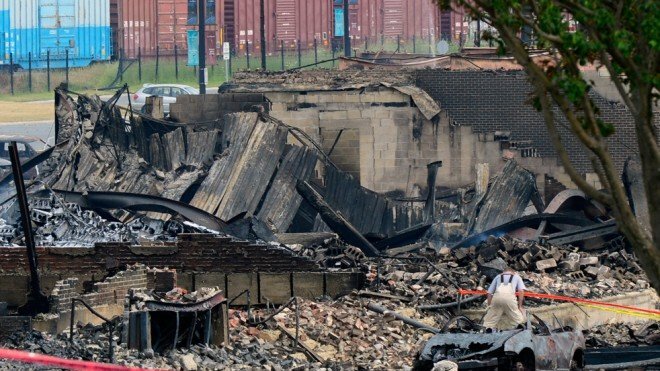 At least five of the tanks exploded, one after another, in Lac Mégantic's popular, bar-laden hub, which would have been bustling on such a warm summer night. Two of the tankers reportedly burned for more than 24 hours before firefighters could contain the flames with water and foam. "This is an unbelievable disaster," said Canadian Prime Minister Stephen Harper, who toured the town on Sunday. "This is an enormous area, 30 buildings just completely destroyed, for all intents and purposes incinerated. There isn't a family that is not affected by this." The idyllic town of about 6,000 people is situated just west of the Maine border and 155 miles east of Montreal. After the explosions, some 1,000 residents were evacuated during the night and several hundred more left the next day to escape the air that was thick with black smoke. At least 40 residents are still missing. The town's core — a mix of homes, historic buildings, restaurants, and stores — was almost completed destroyed, reported the Montreal Gazette. One popular weekend destination, the Musi-Café, where dozens of people are believed to have been gathered around 1 a.m. on Saturday, was utterly decimated and remained smoldering long into Sunday. "I have a friend who was smoking outside the bar when it happened, and she barely got away, so we can guess what happened to the people inside," one resident told the Associated Press. "It's like a nightmare. It's the worst thing I can imagine." "When you see the downtown of your city almost destroyed, you think, 'How are we going to get through this?'" said a teary-eyed Mayor Colette Roy-LaRoche Saturday morning. "But I can assure everyone here that all the authorities and ministries have been very supportive. We have deployed all the resources possible." With the oil-fueled blaze finally extinguished, the hunt for victims and remains begins.